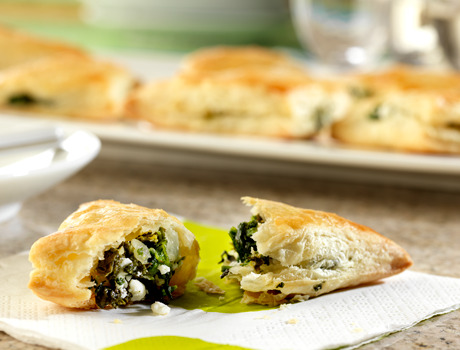 Feta cheese and spinach are wrapped in flaky puff pastry in this tasty appetizer. Good thing they're easy to make, because they're sure to disappear fast. Heat the oil in a 10-inch skillet over medium heat. Add the onion and cook until tender. Add the spinach and cook for 3 minutes. Remove the skillet from the heat. Stir in the cheese and black pepper. Let the mixture cool to room temperature. Unfold the pastry sheet on a lightly floured surface. Roll the pastry sheet into a 12-inch square. Cut into 16 (3-inch) squares. Brush edges of the squares with water. 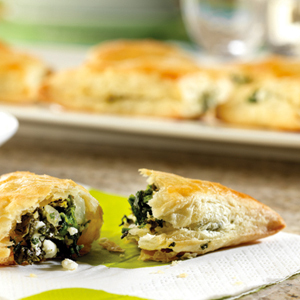 Place about 1 tablespoon spinach mixture in the center of each square. Fold the pastry over the filling to form triangles. Press the edges to seal. Place the filled pastries onto a baking sheet. Bake for 15 minutes or until the pastries are golden brown. Remove the pastries from the baking sheet and let cool on wire racks for 10 minutes.